Included in the animal voice cast are an eclectic bunch, including Ralph Fiennes as a tiger, Selena Gomez as a giraffe, Kumail Nanjiani as an ostrich, Craig Robinson as a mouse, Carmen Ejogo as a lioness and John Cena as a polar bear. Recurring characters from the book series include Jip the dog, to be voiced by current Spider-Man Tom Holland and Chee-Chee the gorilla (originally a monkey in the books and a chimpanzee in the 1967 movie), voiced by Rami Malek. Polynesia the parrot, who teaches Doctor Dolittle how to speak various animal languages and was the only animal who actually spoke English in the 1967 movie, will be voiced by Emma Thompson. The role of the duck housekeeper, Dab-Dab, will be voiced by Octavia Spencer, recent nominee for Best Supporting Actress in the "sorta-furry" Best Picture winning The Shape of Water and voice of Mrs. Otterton from Zootopia. Dab-Dab, as a semi-aquatic anthropomorphic animal cleaning lady, would seem to be a combination of her roles in those two movies, as she played a cleaning lady in The Shape of Water (as well as a maid in her Oscar winning role for The Help). Finally, Marion Cotillard will play a vixen named Tutu. This character may be a combination of an owl named Two-Two from the books with the character of Sheila (no relation) from the 1967 movie. The 1967 movie is actually an infamous box office flop and critically maligned movie which featured a notoriously disastrous shoot. Despite all this, it still managed to be nominated for Best Picture at the 1967 Oscars; it has the reputation of being one of the worst, if not the worst, movie ever nominated for that honor. This was helped by the fact that it's producer, Arthur P. Jacobs, was a former publicist (screenings of the movie for Oscar voters featured elaborate buffets, for instance, which caused the Academy to institute rules against serving food at Oscar screenings for movies). Though it would not be considered very "Oscar bait-y" today, large scale musicals won Best Picture four times during the sixties, including The Sound of Music and My Fair Lady, for which Rex Harrison won a Best Actor Oscar, and which the main competition for the Best Picture prize was one of Disney's few Oscar players, Mary Poppins. The very next year after Doctor Dolittle was nominated, the G-rated Oliver! won the top prize. 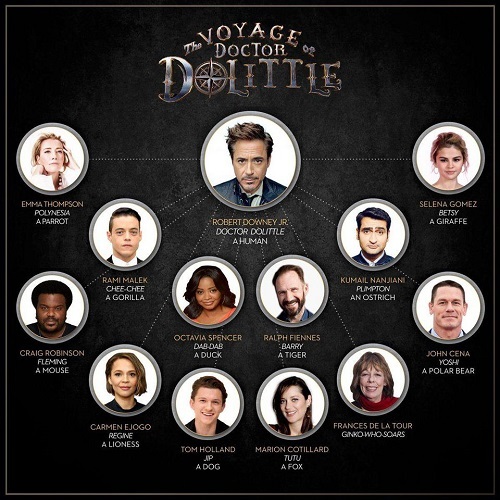 Doctor Dolittle was nominated in nine total Oscar categories, and won Best Visual Effects and Best Song (for "Talk To The Animals"). Doctor Dolittle at one point was to feature Sydney Poitier in a supporting role (meaning three of the five 1967 Best Picture nominees at one point featured Poitier), while Rex Harrison's combination of ego and alcoholism at another point caused him to be replaced by (who else?) The Sound of Music's Christopher Plummer. The book Pictures at a Revolution by Mark Harris tells the story of the making of the five movies nominated for Best Picture in 1967, which also included Bonnie and Clyde, The Graduate, Guess Who's Coming to Dinner and eventual winner In the Heat of the Night, and is a good guide for the circumstances that lead to a movie like Doctor Dolittle being made and marketed as an Oscar movie. The 1998 movie was much more successful at the box office, though still not a hit with critics, and much less successful at the Oscars, with no nominations. This movie had very little to do with the Hugh Lofting books, taking only the basic premise (a doctor who can talk with animals) and the name and nothing else. The animals in this movie are actually voiced, unlike the 1967 movie, and there is no explanation given for Dr. Dolittle's communication skills, which are essentially supernatural rather than a learned skill. The movie spawned one sequel also starring Eddie Murphy, and then three direct-to-DVD movies without him. I heard they finally found someone to do the voice of the polar bear. And his name is... JOHN CENA!!!! "You can't see me! This is strictly a voice role!" The polar bear’s name is Yoshi? !